Williston’s Head Athletic Trainer Rob Kearney stands out in a crowd. He sports a lizard-like Mohawk haircut and a bright pink tie. He exudes confidence and strength. And that’s because he’s strong. 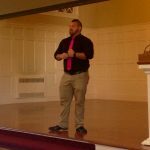 He’s one of the world’s strongest men, having appeared on televised “World’s Strongest Man” competitions and having pulled busses and airplanes and having deadlifted 925 pounds. Here’s his WSM profile. 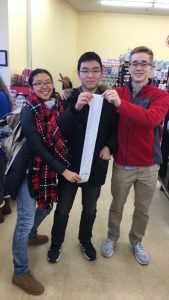 On April 21, 2017, Williston will take part in a nationally recognized event called Day of Silence. According to GLSEN, an organization that advocates for LGBTQ rights in K-12 schools, Day of Silence is a student-led national event organized in thousands of schools, bringing awareness to the silencing effects of anti-LGBTQ name-calling, bullying and harassment in schools. Students from middle school to college take a vow of silence in an effort to encourage schools and classmates to address the problem of anti-LGBTQ behavior by illustrating the silencing effect of bullying and harassment on LGBTQ students and those perceived to be LGBTQ. 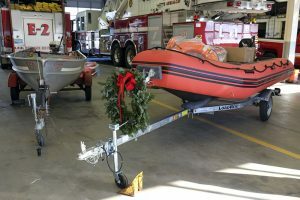 The City of Easthampton is scheduled to accept a gift of a rescue boat from the Williston Northampton School at a Dec. 21 City Council meeting. The equipment replaces an aluminum boat that dated to before 1953, according to Fire Chief David Mottor. The new craft is a 14-foot Defender 430 Zodiac-style inflatable with a 25-horsepower outboard motor and a hard hull. The design makes rescuing much easier, Mottor said. The older boat, which was not designed as a rescue vehicle, has high sides, making it difficult to pull people out of the water, and increasing the risk of injury to the rescuer, Mottor said. “The new boat has a lower profile, it’s lighter, and it can be brought to the water’s edge anywhere. We don’t have to use the boat launch, which will reduce our response time,” he said. The police and fire departments undertake rescue, enforcement, and spill-response activities in Nashawannuck Pond, in the Oxbow of the Connecticut River, and on the Manhan River. Mottor said the new boat with a bigger motor will allow a crew to pull oil spill response equipment, such as booms, through a stronger current. 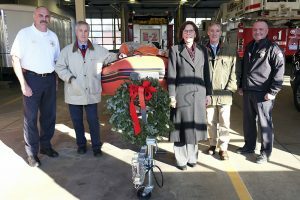 Williston Chief Financial Officer Charles McCullagh, who, along with Head of School Robert W. Hill III, worked with the city to identify a donation that would best serve the community, delivered the craft to the fire department on the morning of Dec. 20. McCullagh, Hill, Mayor Cadieux, Chief Mottor, and Chief Alberti posed for photos next to the old and new boats. “Our public safety professionals need quality equipment to do their jobs well, and we are proud to support their efforts,” Hill said.